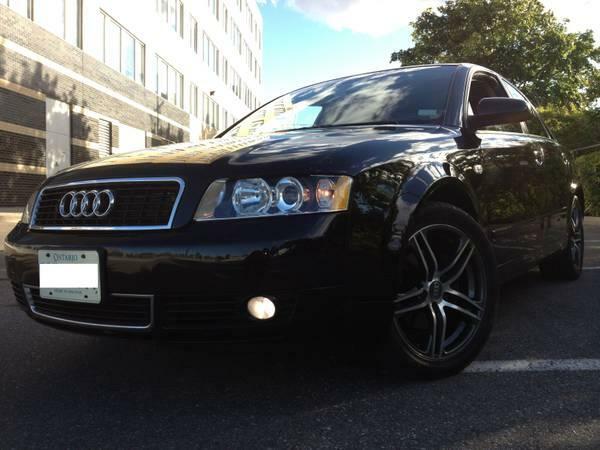 2004 Audi A4 1.8 turbo, Automatic, physically and mechanically near perfect. A reliable sporty looking car, Black leather interior,black dash,17 inch wheels, and much more. Second owner, car is in very mint condition! Its good on gas and low on insurance. The car has no issues and is running just as strong as it ever has. Currently 125000 original KMS. The car has been extremely well taken care of and has always been parked inside garage. We are selling because we live in a condo building and have two cars and one parking. we do not use second car much and are paying lot of extra money for the second parking. $8850 FIRM - with safety and emission + Audi Stock rims and tires + An extra set of audi rims and tires (the one in pictures) spent $1400. $8200 FIRM - As is with audi stock rims and tires only.